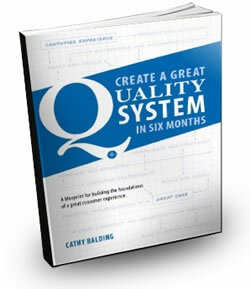 This book is a step by step, month by month blueprint for building and implementing a quality system that staff will want to use to create a great consumer experience for every person, every time. The strategic quality system blueprint is based on the literature, applied research and real world experience that formed the basis of my first book ‘The Strategic Quality Manager’. It builds in buy-in: instead of developing your quality system and then starting on the long journey to gaining staff co-operation, ‘Create a Great Quality System’ does both at once – merging quality mechanics with quality mindsets. Postage and handling, $5.50 within Australia - $11 International. Please allow 1-2 weeks for book delivery in Australia and 2-3 weeks for delivery outside Australia. If you pay via direct deposit using the bank details on the order page, your book will be shipped as soon as we receive notification that the funds have been deposited in the Qualityworks account. CGQS hard copy book price: $38.50. Order 5 or more copies of the CGQS and receive discounted book rate of only $33.00 per copy.